The man who invented the Russian Reversal has a new act that’s equal parts standup, one-man show, motivational speech, and TED talk. 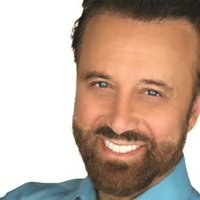 Yakov Smirnoff, the Russian-born comedian who made a name for himself in the 1980s with his fish-out-of-water shtick, is back. That’s right, the guy who pioneered the Russian Reversal (ex: “In America, you watch television. In Soviet Union, television watches you!”) has a new act. He’s a doctor of love. No, really. It was 1989. Smirnoff had a thriving standup career and regularly appeared in movies —Heartburn, Moscow on the Hudson, The Money Pit, Brewster’s Millions—playing some variation on “the wacky Russian guy” character. He had a house in Pacific Palisades with a wife and young daughter. No doubt about it, Smirnoff was living the American dream. Then the Berlin Wall fell. Smirnoff spent two decades headlining his own theater in Branson. While mining the tension between the United States and Russia, he noticed another kind of conflict, the cold war between men and women. After studying for—and earning—a master’s degree in positive psychology from the University of Pennsylvania, he began developing a new show that combines his two disparate interests, comedy and relationships. Happily Ever Laughter is equal parts standup, one-man show, motivational speech, and TED talk, and whatever notions you may have about Smirnoff, it will likely explode them. Sure, the show includes several Soviet-era jokes (and they’re actually still funny), but the 1.5-hour performance quickly moves into deeper territory. As much as you laugh, you may also find yourself tearing up. For one more weekend, you can catch Happily Ever Laughter at the ACME Comedy Theatre—until Smirnoff returns with the show in December. Now that he’s in a new phase of his career, Smirnoff plans to live in Los Angeles most of the year where he’ll be tweaking his act, trying to launch a reality show, and using Los Angeles as fodder for his research into love and laughter. What a country? What a city!